This is a gorgeous vintage French fabric covered boudoir box with drawers dating from the 1950's. It would have been used by a lady to store gloves, handkerchiefs and stockings. It has survived the years in wonderful condition and would be a pretty and useful addition to any boudoir. 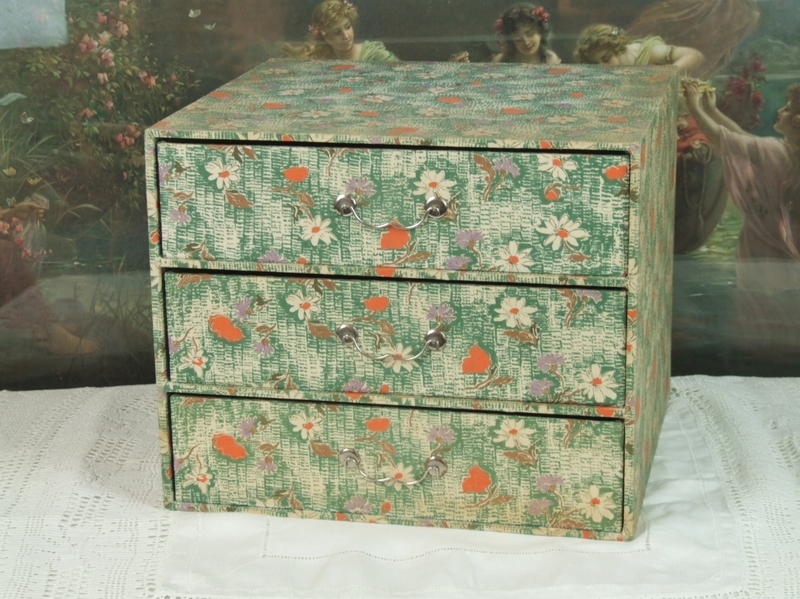 The boudoir box and the fronts of the 3 drawers are covered in a lovely fresh cotton fabric with orange, white and purple flowers on a green and white background. The fabric is in good vintage condition with a subtle fading to the corners of the top. The drawers are lined with beige paper and are clean and fresh. Each drawer has a chrome pull. It can be seen in our shop in Frome, Somerset. Please contact us for international delivery cost.